The film version of a singer covering an old favorite on open mic night, writer/director Jeff Grace's brand new indie Folk Hero & Funny Guy feels like a modern rendition of a 1970s bromantic dramedy (with a little bit of Once and Sideways thrown in for good measure). 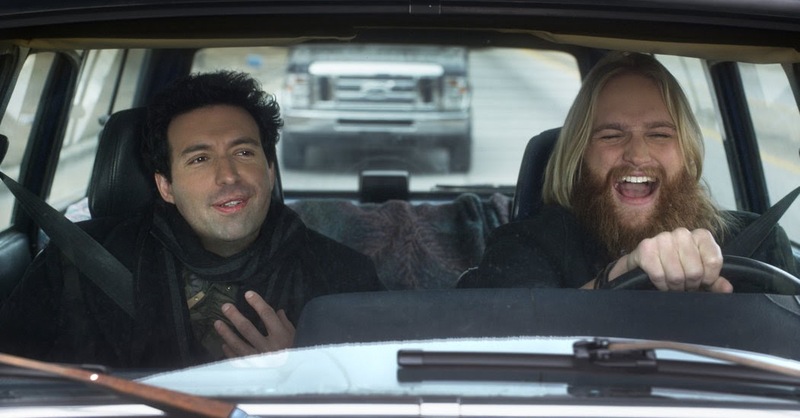 Playing lifelong friends who impulsively set off on tour together after famous singer Jason invites down-on-his-luck aspiring comic Paul to open for him, Cold in July’s Wyatt Russell and Girls star Alex Karpovsky turn in terrific performances as the film's titular folk hero and funny guy. 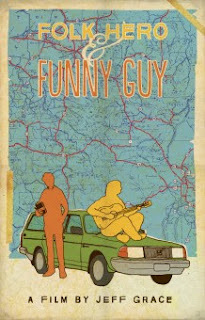 Relying upon the familiar refrain of youthful banter and raucous laughter to distract from present-day differences in personality, status, artistic fulfillment (as well as how much they fear they might have drifted apart), Jason leads Paul on one aimless adventure in one small town bar after another. Quickly driven to distraction on their first night away from home by Bryn – a talented up-and-coming singer/songwriter who crosses paths with Jason and Paul after signing up for the same open mic night the guys are talked into doing – Jason surprises Paul by inviting her along on tour as a second opening act. And with Bryn portrayed by one of my current favorite small screen scene-stealers in the form of actress Meredith Hagner (whose energetic charm has consistently elevated her work in everything from holiday cable movies to sitcoms), the character is just what the film needs to balance things out while helping to infuse it with humor and heart. Originally funded on Kickstarter and now available on demand, this impressively made effort is enhanced by inventive edits and scenic "wish you were here" cinematography. Centered on artists hoping to get themselves and one other out of their rut and onto the right path, comic turned filmmaker Jeff Grace's feature manages to do the same. Steadying itself after a slightly rocky start, Folk Hero evolves into a melodious character driven charmer with which you'll want to sing along. 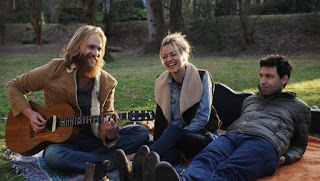 Though ideally suited to music minded viewers who flocked not only to Once but also to Almost Famous (starring Wyatt Russell's half-sister Kate Hudson), Folk Hero & Funny Guy has what it takes to be a word-of-mouth arthouse hit. Text ©2017, Film Intuition, LLC; All Rights Reserved. http://www.filmintuition.com Unauthorized Reproduction or Publication Elsewhere is Strictly Prohibited and in violation of the Digital Millennium Copyright Act. FTC Disclosure: Per standard professional practice, I may have received a review copy of this title in order to voluntarily decide to evaluate it for my readers, which had no impact whatsoever on whether or not it received a favorable or unfavorable critique.